The idea was simple enough: What would happen if 140,000 United Methodists in the southern two-thirds of Illinois set aside a day a month to fast and pray for a common need or dream? And so, when Cabinet co-chairs Randy Reese and Janice Griffith stood before the 2010 IGRC Annual Conference, they issued the invitation for folks to join them on the first Thursday of the month for First Thursdays: A Call to Prayer and Fasting. And while the initial invitation was not met with as much enthusiasm as the announcement that the annual assessment process would be streamlined, it planted a seed that continues to germinate in the hearts of United Methodists in the Illinois Great Rivers Conference. “We are seeking nothing less than clarity from God about our mission and purpose, power to live holy lives, opportunities to testify to the Gospel of grace, to share the love of Christ in tangible ways, and the courage to invite persons to commit their lives to Christ and become part of Christ's holy Church,” Reese said. 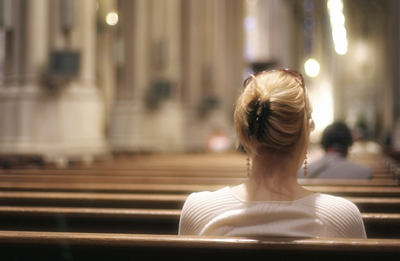 As Bishop Gregory V. Palmer noted in his Episcopal address, the winds of revival are already, noting that even though worship attendance and membership continue to show slight declines, the number of professions of faith increased in 2009 for the second consecutive year. Within a week, a group was established on Facebook to share ideas and best practices as to how to implement this call to a day of prayer and fasting. Within a week, 200 persons had joined and that number has doubled after just two First Thursday observances. And the testimonials of individuals and churches tell a story of transformation. "I really appreciate the conference providing tools to help have a theme each month and I love the idea of sharing this day with everyone else across the conference," wrote Karen Stauffer. "Although last month (in July) was not so successful for me, I improved yesterday completing the fast. Each month I hope to build a more established habit of sacrifice and reflection. Jesus used a time of fasting to prepare for the next step, I know that if we draw near to Him, our conference's next step will be revealed." As pastors and lay leaders have begun this journey, they have also invited their congregations to join as well. August’s Back to School theme was a perfect opportunity for several churches to combine the day of prayer and fasting with mission work for the schools. In the communities of Girard and Virden, just south of Springfield, the fall brought with it a change brought about school consolidation. The United Methodist churches in these two communities used it to provide ministries to the employees who were returning to a newly formed school district. 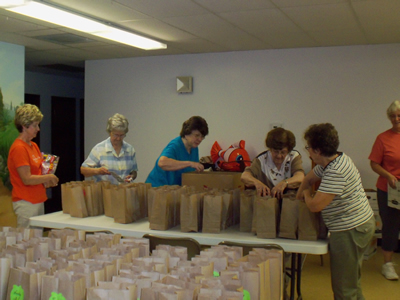 The churches also assembled more than 200 goodie bags for all employees in the new school district. Each bag included an apple, small school supplies, "sweet treats" and a card assuring them that they would be thought of and prayed for during the school year. At Salem Grace UMC, the First Thursday in August was a prelude to the church’s blessing of the school bags on Aug. 15, when school bags were assembled with school supplies and prepared for the community’s children. At Collinsville and Galva, prayer walks were organized as part of the Back to School theme. “From the reaction of those that took part, we had to add an evening prayer walk so we could cover the entire community and include those who work during the day,” reported Rev. Mark Horn, pastor of Collinsville First UMC. The Galva Back to School Walk got the notice of the Galesburg Register-Mail, who assisted the congregation in publicizing the prayer walk. From that introductory page, there are pages located along the right-hand column of the webpage that will provide some general resources on prayer and fasting and resources (prayers, litanies, hymns and other worship helps) specific to the theme of the upcoming monthly observance.